The following interview with Bishop Tamás first appeared in East-West Church Report, a quarterly publication about Christianity and Christian ministry in the former Soviet Union and Central and Eastern Europe. To subscribe to the report click here. We are grateful to its author, Geraldine Fagan, for permission to republish it here. 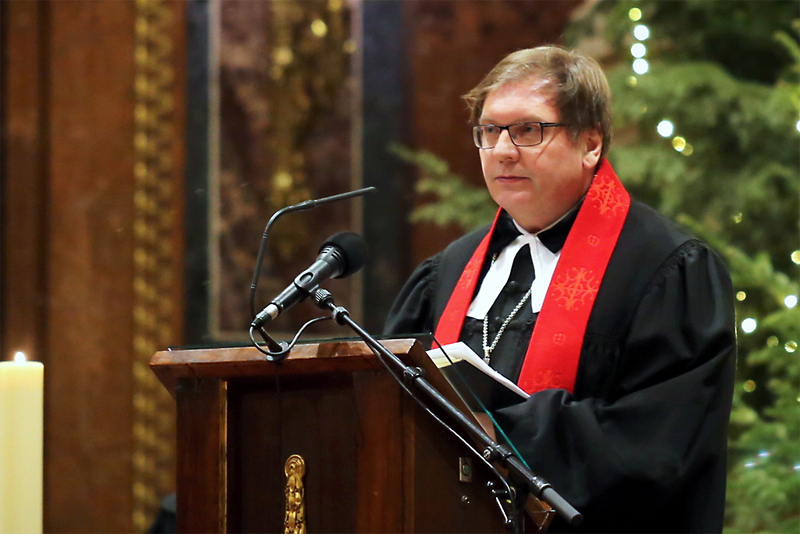 Ordained into the Evangelical Lutheran Church in Hungary in 1982, Tamás Fabiny is now bishop of its Northern District, one of three dioceses. He has studied in Germany and the United States, and was a vice-president of the Lutheran World Federation from 2010-17. The East-West Church Report met Bishop Fabiny in his study in Budapest soon after both had heard Prime Minister Viktor Orbán address the government’s International Consultation on Christian Persecution on 12 October 2017. The Orbán government is keen to project itself as Christian. Does this have a domestic audience? Yes, definitely. It is a very popular theme nowadays; that we are the defenders of Christian values, not only in Hungary, but the whole of Europe. They try to build a bridge between the 16th century and the 21st century. Historically, it is true that at the time of the Turkish invasion in the 16th century, it was Hungary that tried to defend freedom and Christianity on this continent, and of course it is very tempting to say that we have the same situation now. They are saying that we, as a Christian government, are the defenders of Europe. I’m not saying they are right, but in some respects I can understand their point, because it really is true that the Western part of Christianity has become very secular. It is cheap to speak about the forced removal of crucifixes—that is not generally the case—but it is basically true to say that secularism has been very strong, unfortunately, in Protestant countries like the Nordic states and the Netherlands. But this whole attitude that we are defending Christian values is not really friendly — and perhaps not even true. And if somebody has to defend Christian values, it must be the Church, and not the government. Three weeks ago the annual meeting of KÉSZ [Keresztény Értelmiségiek Szövetsége, the Federation of Christian Intellectuals] took place in the upper house of parliament. Orbán also gave a speech there, in which he pointedly said that sometimes we even receive criticism from the churches. I wondered, perhaps he was thinking of me! Or some other bishops, like [Catholic Bishop of Vác, Miklós] Beer or [Catholic Bishop of Szombathely, János] Székely. Contemporary criticism, Orbán said, asks why is a political party dealing with Christianity, with Christian values? Why do we use Christian and biblical vocabulary? I criticize that very often, I say it is almost a heresy, a misuse of biblical terms. He explained that they are doing this because a political party has much wider influence than a church, and the churches should be grateful to us that their goals will be multiplied through the activities of the party! A very logical statement, but a very dangerous one. Where does this come from? After the long experience of Communism, aren’t Hungarian Christians concerned about religion being used to this degree by politicians? That is in fact one reason why many church people — leaders as well as laypeople — are quite thankful and happy to hear that voice. Because for 40 years they never heard anything like that. Just the opposite: there was the official atheistic propaganda. It was very clear that the position of the Church was in the minority, and the position of the government was totally different. The Church had to have complexes or be shy because of state propaganda, and now it seems wonderful to hear them using the same vocabulary and helping us. The other factor is perhaps theological — it might be the influence of Reformed theology. In Reformed theology, there is an opportunity to mix the Kingdom of God with the earthly kingdom. Orbán himself comes from a Reformed background — although as a child he was not raised in a Christian tradition, he was later influenced by Reformed pastors, and I understand there was a very deep search in his personal spiritual life. Some people say he’s only a politician, that he tries to misuse religion, but in my understanding he was touched by religion somehow, touched by that very strong, simplified, Reformed idea of predestination. He feels he has been called, predestined, to speak about the message of God in society. Sometimes he says our duty is to realize the Kingdom of God, with a capital K. In Hungarian, the word is ország, which may also refer to a country. So he’s saying the Kingdom — Ország with a capital letter, which means the Kingdom of God — and the kingdom with a small letter, the earthly kingdom, can be identical, and we on Earth can work to realize the Kingdom of God. That is a nice responsibility for the Church, but not a politician. Do you remember how he finished his speech today? “Soli Deo gloria!” For the past five or six years, he almost always finishes his speeches — even in parliament — with “Soli Deo gloria!” I’m not against it if a church invites him to their event — a renovated church organ or new church building — and at the end, as a Reformed believer, he’s saying “Soli Deo gloria!” But as a politician in parliament, it is a misuse of religious language. How does Hungarian society react? Are people glad to have a self-proclaimed Christian leader, or upset that millions of their tax Euros are going to support the major churches? That is a complex issue, almost a contradiction in my understanding. On the one hand, it is clear that the Hungarian government tries to support the churches. The official government point of view is that Christian values must be strengthened in society. That is why religious education was introduced into schools under Orbán some five years ago, as a choice between religion and ethics. It is about fifty-fifty: around 50 percent chose ethics, around 50 percent chose religion. But honestly speaking, the churches have not been ready for that challenge at all. We don’t have enough experience, trained teachers, premises, schoolbooks, and so on. Yet the government tried to introduce it as quickly as possible. The general observation in society is that the churches are in an almost privileged position, including financially. On the other hand — this is why I’m saying it is an almost contradictory issue — churches are losing members all the time. It’s very clear that contemporary Hungarian society is becoming more and more secular. If you look at the census in 2011 and compare it with 2001, you will see that in ten years almost all the churches lost around 30 percent of their membership. Of course, for me that is not a happy situation, because I wish the influence of the church were stronger and the number of church members would increase. That is somehow not the case. Yet the official state propaganda says all the time what an important role the churches play. Since it bucks the general trend, could this strongly pro-Christian political line nevertheless appeal to a certain crucial segment of the voting population? I can imagine that some people understand this situation as being in the 24th hour. That after 40 years of Communism, after 20-plus years of secular Western influence and all the social problems, it is the very last moment for the churches to be somehow reorganized. But it is difficult to say if people in general are positive towards the churches having a bigger role in society. How about the public attitude towards refugees? How typical a response was what happened in the village of Őcsény recently? It’s not exceptional, more a case study; that is my sad personal experience in the last two or three years. Hungarian society is becoming more and more intolerant, and sometimes even hostile, towards others. It is fortunately now clear to most people that it is not fair to speak against the Roma — which used to happen — or Jews, or homosexuals, but they are very happy to have a legal opportunity to blame somebody: the migrants. That is tragic. Even communities that have not met any migrants or refugees take such a hysterical approach. I hear it from congregation members. A year ago, I sent a new assistant pastor to a village in Nógrád region in the northern part of Hungary. He was brand-new there, and he just went through the village in order to find the pastor and the church. And the gossip started in the village — there is a refugee, there is a migrant in the village! But he was the Lutheran assistant pastor! This was just because he was unknown there, and having an unknown person was considered a danger. That is very painful. Őcsény became widely known because this sentiment was concentrated in dramatic action: the damage to the car of the guesthouse host. But on a verbal level, unfortunately, it is commonplace. Do the media influence this? Yes, and it is a very slow but successful brainwashing. We see it in the whole Soros campaign. A friend of mine, for example, a university student, regularly visits a woman who is almost blind. He reads the Bible to this old lady—a very pious Catholic woman. She told him that it is forbidden to hate anyone, but she has one exception. She discussed it with the good Lord, and He gave her permission to hate… George Soros! So when people read their Bibles and come across the parable of the Good Samaritan, do they allow themselves an exception for migrants? Do people see any contradiction between the Gospel message and the government line? Or do they — especially older people — follow the politicians’ message because they are used to following authority without thinking? One reason might be that, for the first 20 years after the end of Communism, we had a new government after almost every election. First conservative, then socialist, then [Orbán’s party] Fidesz, then socialist again. In Hungary, a socialist government actually means post-Communist. Many church members were not satisfied with these socialist or post-Communist governments, and they understood Fidesz to be the only alternative. That is why they try to follow Fidesz without any criticism. They are saying, “At least there is a party supporting us, we were suffering so much in the Communist times, we were suffering under Gyula Horn [socialist Prime Minister 1994-98], we were suffering under Ferenc Gyurcsány [Prime Minister 2004-09],” who was a liberal, post-Communist person and didn’t care about the churches. “Now, finally, there is this Orbán, although he comes from a great distance, because his earlier behavior was also not so friendly, but finally he is supporting us.” That is why, I think, many people, even in the churches, support him without criticism. The other factor — and here I have to express a little self-criticism — is the danger of the influence of Islamist radicals in Europe. I used to speak very casually in my statements and interviews about how the government is demonizing people. During 2014 and 2015 official propaganda said that the migration crisis would conclude with a terrorist danger in Europe. I said at that time, “Oh, that is ridiculous.” Now, I’m not saying I’m worried, but I’m trying to see it in a balanced way. Unfortunately, it seems to be true that many people misuse the welcoming culture, and many people come to Europe without trying to integrate; they want their own isolated situation. The danger of parallel societies, which is present in some European cities, is in my understanding a real danger.